It’s always so much fun working alongside Lynn Spence to outfit this Cityline segment. We’re back with the hottest swimwear and accessories trends for 2018! See below for a full list of featured swimsuits and cover-ups. But first, make sure to watch the episode here! For more information on the segment, leave us a comment below or send us an email. Hello I ami interested in the grey wrap pants/sarong style featured on cityline. Can w buy these on line? Do you have all sizes available? Kathryn, I wondered the same thing as I watched the Cityline swimwear episode. In today’s tech driven society,it so dumb to feature a product that you cannot purchase easily online. How much are the pants and what other colours do the come in? These pants are $143 and only come in the black/grey colour. They are currently sold out due to popularity after Cityline, but we can add you to the call list as we are working on bringing more in. When will the Lily Rose bikini top modelled on city line be available? This style is currently available. All of our swimwear (and most of our lingerie) are available in-store or by telephone order. If you would like to give us a call at 416-485-0576, we can help you further. This bikini is sized 6-12 in both D and E cup. These pants are $143. They are currently sold out due to popularity after Cityline, but we can add you to the call list as we are working on bringing more in. I would also like to order the sea folly wrap pants. I know the price. Can you tell me the sizes you will be getting in? 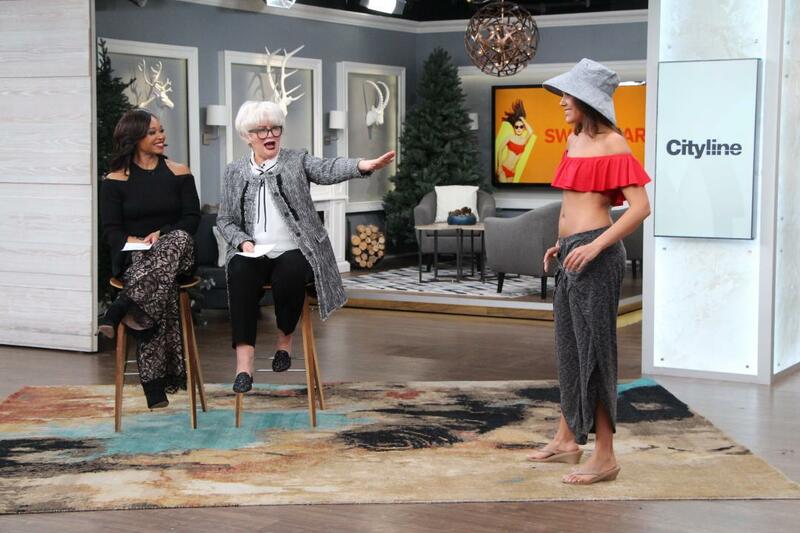 Hi – I LOVED all the suits today featured on Cityline. Can you give me the price (or a ballpark) of the bathing suits featured in looks 2, 6, and 7? Thank you for your interest! We have sent you an email with detailed pricing information. Hello. Please add me to your call list for the wrap pants featured on Cityline. I believe I would be a size small. Thank you! We have added you to the list. 🙂 We will be in touch!